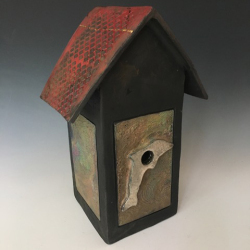 Come spend the weekend at Featherstone with Lois Hirshberg exploring the magic of several fast-firing techniques. Western Raku, Horse Hair Raku, and Saggar will be some of the spectacular techniques that we will be exploring. These firing techniques never get boring. It is the unpredictability of the process that makes this weekend so exciting. This workshop is open to all levels of expertise. Bring 8 to 10 bisqued pieces. Glazing Friday night and two days of different firing on Saturday and Sunday. 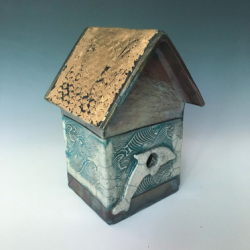 Lois Hirshberg began working in clay in 1975 at Mudflat Studios in Cambridge where she fell in love with clay. Lois holds an M.Ed in Community Counseling and a M.A. in Art Therapy. She has studied ceramics in Jerusalem at the Bezalel School of Design and in Japan through Parsons School of Design. A spectacular alternative firing technique! Unlike most ceramic firing processes Raku is a very fast process. Red hot pieces are removed from the kiln and smothered with combustible materials to create flashes of color in the glazes. Results will vary from turquoise to intense red/bronze to beautiful white crackle. We will also be experimenting with horse hair Raku. Raku never gets boring. It is elusive, mysterious, and totally at the mercy of nature’s fire. The unpredictability of the process is what makes it so exciting. Lois will also be demonstrating slab built vessels. This Raku workshop is open to all levels of expertise, people with little previous clay experience are welcomed.